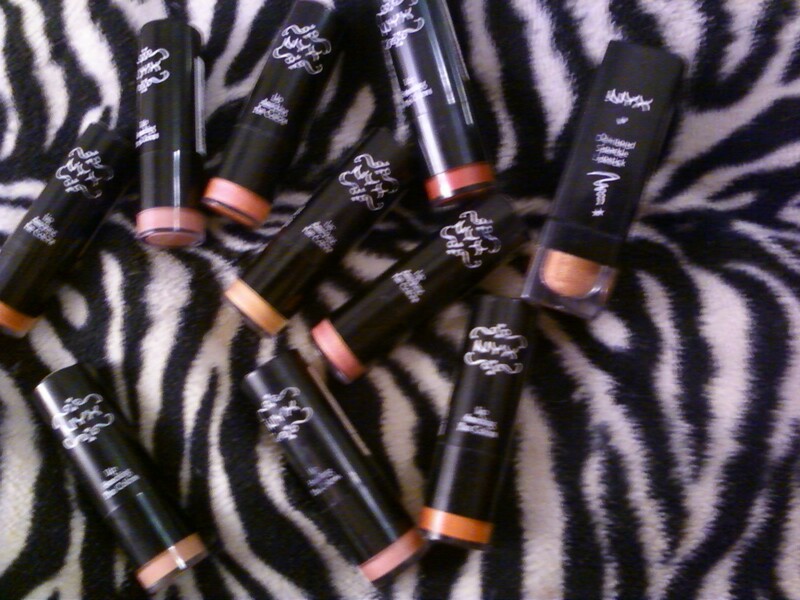 Sparkle and Shine: My Nyx Lipstick Collection! I started making the venture into lipstick about a year ago. I had tried to wear lipstick lots and lots of times but it scared me and I always felt like it looked so messy and uneven. Well after years of only wearing lip glosses and stains I gave it one more try. I am now addicted to lipstick. I wear it every single day. The key for me was finding the right colors. If you are not careful and you are buying drugstore lipsticks you can sometimes end up buying colors that are a little bit mature and don't follow the trends. I do acknowledge that some brands like Revlon have some really great colors, but for me I had to discover Nyx lipstick before I could truly appreciate the stuff. 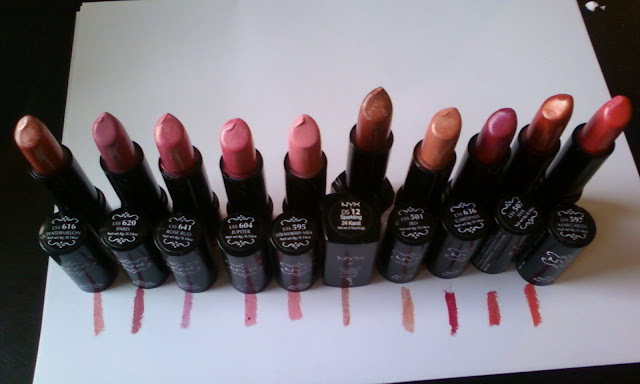 Nyx lipstick is very creamy and pigmented and the colors are fun and young. Also I can wear it all day long without it irritating my lips so if you have sensitive skin like me, you should be safe. Nyx lipstick is also super affordable it is about three dollars a tube! I have several different colors so I thought I would just give you the run down of what I like and what I don't! I'm going to list these in order of my favorites to my least favorites! My ultimate favorite color is Watermelon. It is a very pretty orangey pink color. Watermelon is a misleading name because you expect it to be really dark and red. It has more gold and orange in the pink than it does red. It wears really nicely with some shine but not any glitter or shimmer. My next favorite is called Paris. It is a dark pink that wishes it was a mauve, but it is too pink. This is a matte color so it wears very demurely. It is not a neutral color but it is mute enough to be an everyday color. The next color is called Rose Bud. This is almost the color of my lips but has a pretty gold shine to it. Very pretty and very discreet. This would be a good neutral for people with yellow in their skin or with beige skin. Jupiter is very similar to Rose Bud. It is the same natural lip color but it has blue undertones to it. It also has a good bit of silver shimmer in, not overwhelming but pretty sparkly. I'm a little torn about the next color. This color is called Strawberry Milk and it is true to its name. It is a matter color that is highly pigmented. Straight up milky baby pink. I LOVE THIS COLOR. I have seen other people wear it and they look amazing. I look crazy when I have tried so far.This color is definitely better for people with pail skin, however I am not going to stop trying to wear it yet! All of the lipsticks besides this one are just Nyx's run of the mill "lip smacking fun colors" lipstick. This one is from their Diamond Sparkle Lipstick line. The color is called Sparkling 24 Karat but I don't like that name. The color has some pink and brown it but mostly it just has sparkle. I fond this color a little bit hard to wear because it is sooooo sparkly. I do like it as a top coat on top of another color. The next color is called Iris. It is beige with some pink in it and some iridescence. I find this color very hard to wear. It is very very pale so I have to be careful to not let it wash me out. I can make it work with a pink gloss over it. I have a love hate relationship with next color just like strawberry milk. This color is called Gardenia and it is a bright deep pink. It is a very very deep magenta in the tube, but because it has some blue undertones when you put it on your lips it looks more like hot pink. I really want it to be the deep magenta I see in the tube but when it actually goes on my face it is a different color. I do like the color is applies as but I just want the other color. I feel like I have been duped. The next color is called Nyx. I thought since it was named after the line it would be special. I bought it in the autumn when I was looking for an orangey pink.... Well this is just orange. Seriously this is just orange. I look ridiculous when I put this on and I have not successfully worn this color in public....yet. My least favorite color that I have purchased is called Margarita. This is the most barbie bright pink ever. You would think this would make me love it.... no I do not. It applies this weird super bright iridescent color and it looks like Halloween makeup. It is just too bright. I admire anyone who can make this color work. 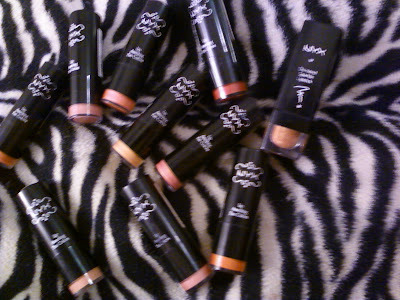 Ok that is my Nyx Lipstick collection! Go out and find your favorite!